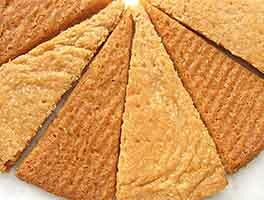 These buttery-rich, crisp shortbread cookies are a great wheat-free alternative to classic shortbread. Without the additional coconut flavor, they have the faint aroma and taste of coconut thanks to coconut flour. With the flavor, you'll have a cookie with robust coconut taste, perfect for dunking into a pot of chocolate fondue or glass of milk. Of course, flavored or unflavored, we think these cookies are perfectly snack-able as is, in all their subtle or robust coconut glory. 18 mins. to 27 mins. Preheat the oven to 400°F. Lightly grease a baking sheet, or line it with parchment. Mix all the ingredients, by hand or mixer, until a well-blended, cohesive dough forms; this will take about 2 minutes at medium-low speed in a stand mixer. Drop the cookie dough by teaspoonfuls onto the prepared baking sheet (a teaspoon cookie scoop works well here), leaving 1" between them; these cookies won't spread much when they bake. 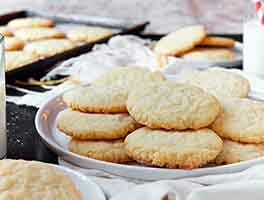 Use a fork to flatten each cookie to about 1/4" thick, making a cross-hatch design. Bake the cookies for 8 to 12 minutes, until just browned on the bottom. Allow the cookies to cool completely on the baking sheet. For flavored variations, add up to a tablespoon of lemon or orange zest (grated rind), or a teaspoon of ground cinnamon or vanilla extract. For crunchier cookies, substitute vegetable shortening for half the butter. 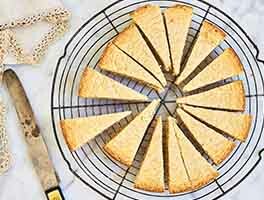 This recipe can also be made in a stoneware shortbread pan. Press the cookie dough evenly into the lightly greased pan. Bake at 350°F for 22 to 25 minutes, until the edges are dark golden and the surface is pale golden. I doubled the recipe. Changes I made are swapping almond flour for 1/2 of the flour, only one egg. I sprinkled some flaked coconut before flattening them. They don't have the texture of a shortbread, but they were very tasty! I love them with hot tea and will make them again! I pretty much made this exactly according to recipe. I used salted butter and I think the extra salt enhanced the flavor. My sugar was infused with lavender. Really good. I definitely didn't get 22 cookies. But they set up super well and baked nicely. I topped with dark chocolate drizzles and toasted coconut. Pretty darn yummy. Aroma of coconut flour is wonderful.. used honey instead of sugar and added a drop of orange oil.. definitely a keeper.. I made these cookies using both an egg and butter replacer for a friend with allergies. The cookies came out just like the picture. They have a nice smooth mouth feel slightly crisp and great fragrance. However; the cookies were rather bland. I whipped up a dairy free frosting and added some flavoring which gave the cookies an improved flavor. I suspect using real butter will improve the flavor. These are lovely little cookies. I used all purpose flour instead of gluten free. Also, I added 1/2 tsp. vanilla extract and 1/4 tsp. almond extract. I portioned the cookies using a small cookie scoop, chilled the pan a short while in the fridge, and then pressed the cookies down with a fork. Thank you very much. Just finished making them for the first time. Chilled the dough, still too sticky, so I made dough balls and rolled them in the GF flour, which made the fork not stick when I did the criss-cross. They did not spread at all on the cookie sheet (which is ok) but maybe that is because I used parchment paper. I found these cookies to be very bland, even though I used coconut extract. They are for a bake sale, so perhaps I will dip them in chocolate to make them taste better. So far, just made the dough, and it is chilling in the fridge, as it was pretty goopy. I rolled it into balls like I do with PB cookies. I agree that this recipe does not make 22 cookies, unless you want them the size of vanilla wafers. Gritty. Coarse. Not at all cookie like. Definitely a keeper! I used earth balance margarine to make it dairy free, omitted the coconut extract, and dipped them in chocolate and shredded coconut after baking. They have both a nice taste and a pleasent texture. (Most gluten-free things I have tried have either one or the other!) I ended up with 17 cookies, but they baked up just fine. Thank you KAF!